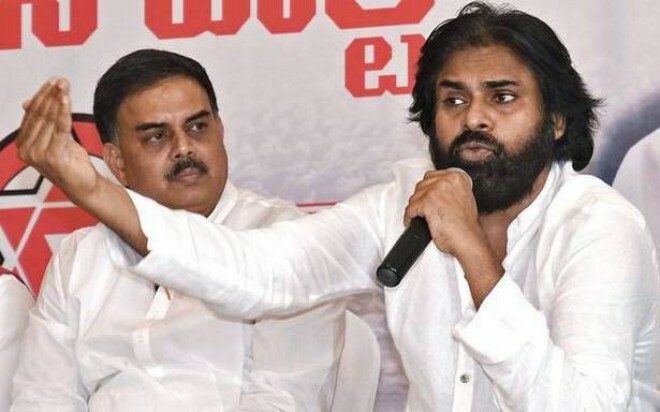 Visakhapatnam, Apr 08: Jana Sena president K. Pawan Kalyan tried to rouse Telangana sentiment again, criticising YSRC chief Y.S. Jagan Mohan Reddy for taking the support of TS Chief Minister K. Chandrasekhar Rao. Addressing a public meeting in Anakapalli in Visakhapatnam district on Sunday he noted that Mr Reddy was saying that the TS government would support AP for getting special category status. "Can Jagan make KCR release a statement that he would support SCS for AP," he asked. Criticising Rao for "interfering" in AP elections, Mr Kalyan said, "If KCR has an interest in AP politics then he can field TRS candidates. There is no need to support Jagan. How can KCR support Jagan when he had stopped Jagan from entering TS in the past?"